Home / FT Lite/ Did the Greeks create our Buddha statues? Did the Greeks create our Buddha statues? Sri Lanka is a country with majority of the population being Buddhists. Since the introduction of Buddhism to the country in 3rd century BC, the Buddhist culture of Sri Lanka has been heavily influenced by regional phenomena. But one of the most striking features of any Buddhist home is the Statue of Lord Buddha, to which various activities of devotion and faith are performed. The calming, yet sharp features of the statue do emanate an aura of serenity and peace. But has anyone thought for a moment about the legendary artisan who gave life to the Buddha statue that we find in our own households? A dig into the annals of time led the way to an answer to that question. But many, almost unconnected, events preceded the creation of this magnificent work of art. Mycenaeans were the first Greeks. They were called as such due to the fact that they were the first people to speak in the Greek tongue. During the late Bronze age Mycenaeans colonised the Aegean islands, Greece and Western coast of Anatolia (part of modern day Turkey). And this happened somewhere between ~3000BC to 1000BC. Much later, around 500BC, these regions and its people (then known as the Ionian Greeks), would be conquered by the Achaemenid Persians. The proud Greeks were not happy about this intrusion and they rebelled against the Persians. But the Persians managed to quell this civil uprising and deported a majority of these Greeks to the north eastern borders of their empire, which was called Bactria. 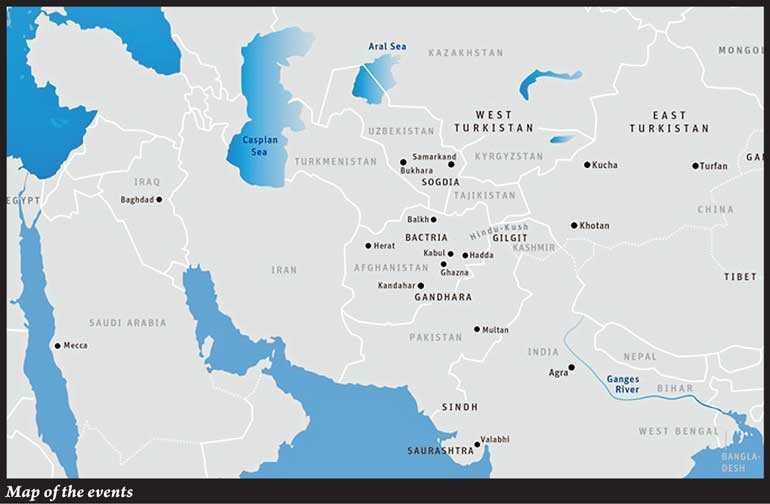 Bactria is a part of modern day Central Asia, including Afghanistan, Uzbekistan and Tajikistan. It was basically an “Australia” for the Greeks, because any rebel or criminal of Greek descendance would be sentenced to Bactria. This incident was very much similar to the colonisation of Australia. Australia too was initially used as a country to extradite criminals of the British kingdom. By the time Alexander the Great’s conquests reached Bactria (almost after 200 years later), it was already Hellenised and had a significant population of Greeks. Eventually Alexander died, leaving his empire fractured into parts ruled by his warring generals. Most of the eastern states were under the Empire of Seleucid. Later, during the downfall of the Seleucid Empire, a Greco-Bactrian king rebelled against the weakened Seleucids and established a new Kingdom – The Kingdom of Bactria. The Bactrians strategically utilised their unique Hellenic (Greek) identity, which even preceded Alexander, to gain control. 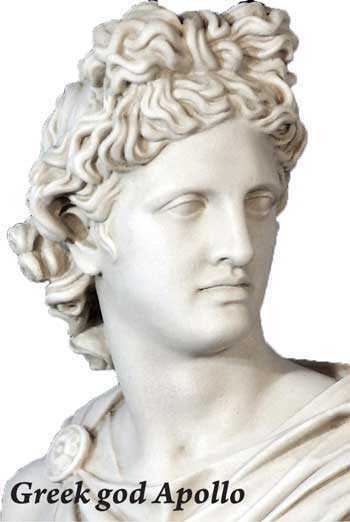 Technically, they were more Hellenic than Alexander himself, since Alexander the Great was born in Macedonia. 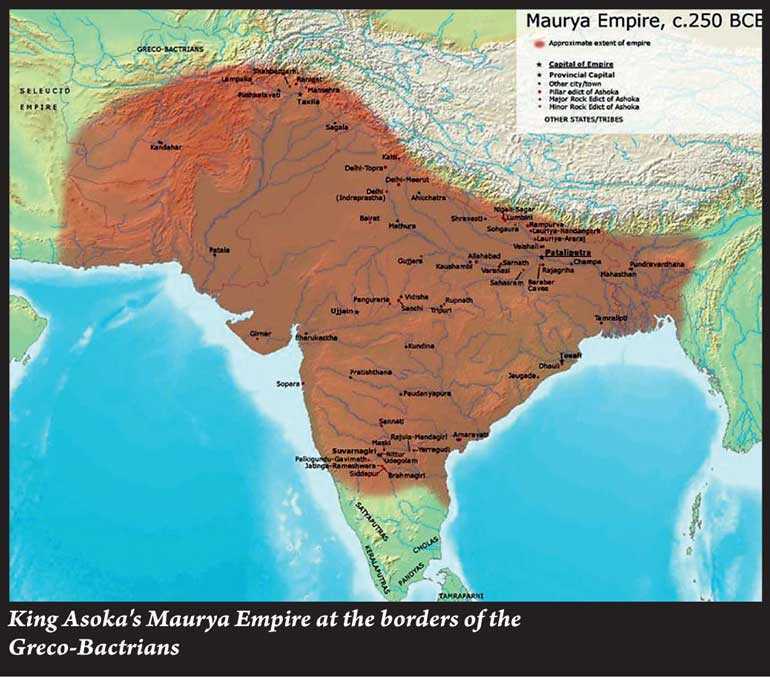 Farther to the south east, over the Hindu Kush Mountains, King Asoka the Great of the Mauryan dynasty was ruling over an almost united Indian sub-continent. It was during this period, King Asoka embraced Buddhism and funded the spread of the religion in the region. Before these events unfolded, during early 3rd century BC, Asoka’s father Bindusara is thought to have clashed against the Greco-Bactrians. This was mainly because the Greco-Bactrians were attempting to unify the former Greek Satrapies (a province governed by a satrap) and so-called “Cities of Alexandria”, which were cities build during Alexander the greats conquests. And Bindusara controlled some of these lands, leading to the conflict of interests. This most likely ended up in arms. The geopolitical connection between Indians and the Hellenics were not only limited to war. This is clearly depicted by the fact that King Asoka’s grandmother was a “Yavana” – The Sanskritisation of the word “Ionian”. She was basically Greek! Later the Bactrian kingdom conquered Punjab, Gujarat and Kashmir. But while their King was campaigning in India, one of his generals (circa ~180BC) usurped the throne in Bactria. This led to the creation of a Greco-Indian Kingdom. According to the Mahawamsa, during this time a Yavana (Ionian) head monk called “Mahadhammarakkhita” graced the inauguration ceremony/foundation laying of Ruwanweliseya, from the capital city of “Alasanda” (Alexandria on the Caucasus). This was a colony found by Alexander the Great, which later became the capital of the Greco-Indian kingdom. This empire lasted into 10 AD, outlasting the Bactrian kingdom by 200 years. Even today, up to 15% of the genealogy of the people of Punjab, Kashmir and Gujarat, is Greek. Despite the political tensions, Buddhism flourished in these regions as the state religion, for well over 300 years (maybe even more). Indians call this the Yavana Period. 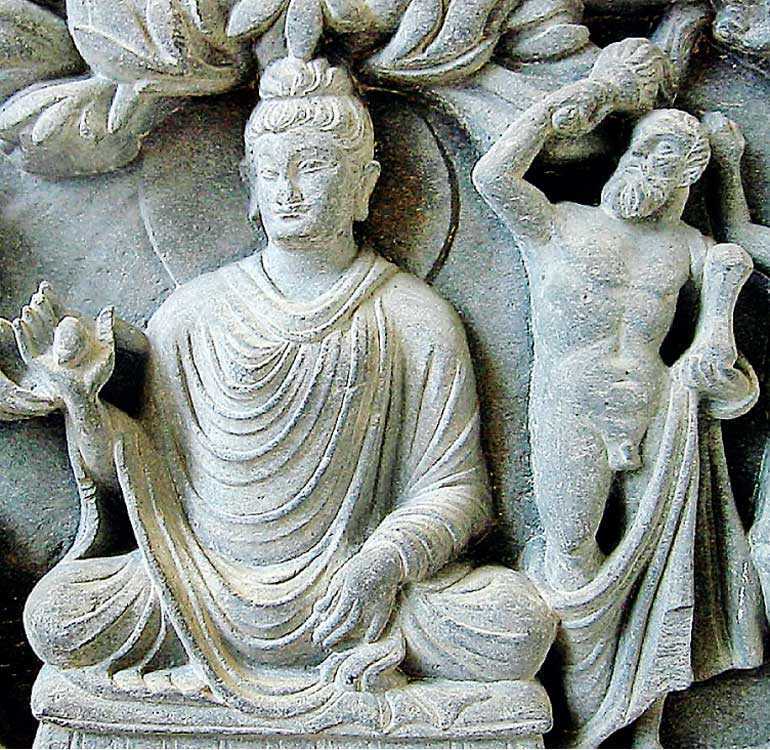 During the Greco-Indian period known as the Yavana (Ionian) period, a new form of art called Greco-Buddhist art was developed. 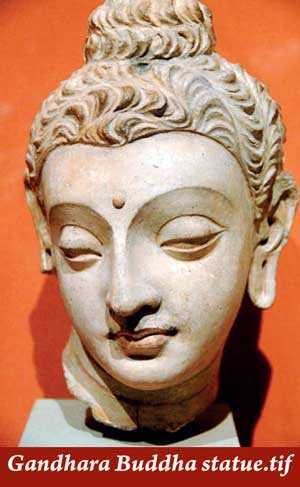 This is commonly known as Gandhara Art. A Pali scripture, named ‘The questions of Milinda,’ confirm that a king by the name of Milinda (Menander), actively promoted Buddhism and its cultural aspect. And the craftsmen who were involved in the building of Buddhist monuments largely borrowed from their Greek ancestry. These artisans were the first to create the modern Buddha statues. Their depictions even included the gods from the Greek pantheon. This is why God Vajrapani is seen protecting Lord Buddha in murals and statues made during this period. Vajrapani is in fact God Zeus from Greek mythology, who was the king of Greek gods. He is usually depicted wielding bolts of lightning. But some historians believe Vajrapani was Herakles, also known as Hercules. Other Greek deities commonly found in Greco-Buddhist art are, the titan Atlas and the Greek wind god Boreas. Atlas in particular is involved as an element of sustenance in Buddhist architecture. Boreas became the Japanese wind god Fujin through the Greco-Buddhist art. The mother deity Hariti was inspired by Greek god Tyche. 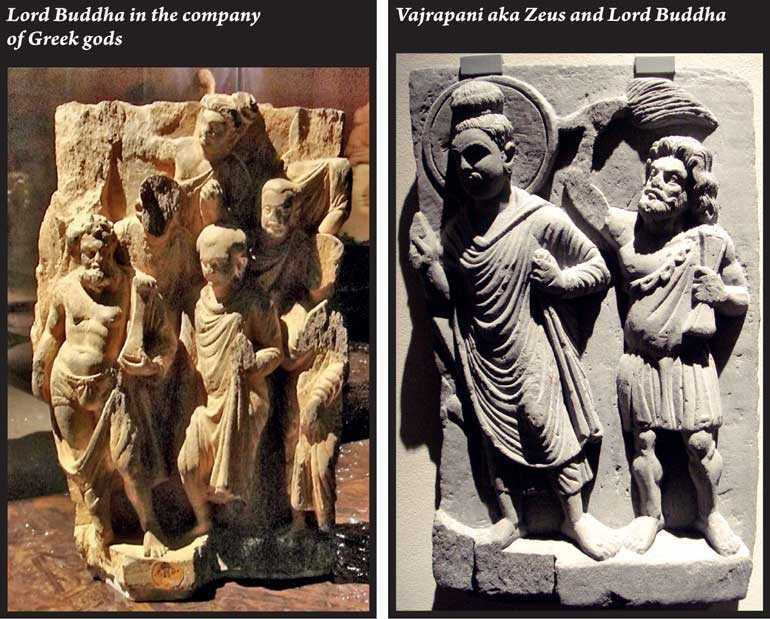 The world heritage Bamiyan Buddha statues, which were destroyed by the Taliban in 2001 March were sculpted through the advent of Gandhara art in to the region. The two giant statues are said to depict Buddhas, Vairocana and Sakyamuni, and were built in years 507 AD and 554 AD. 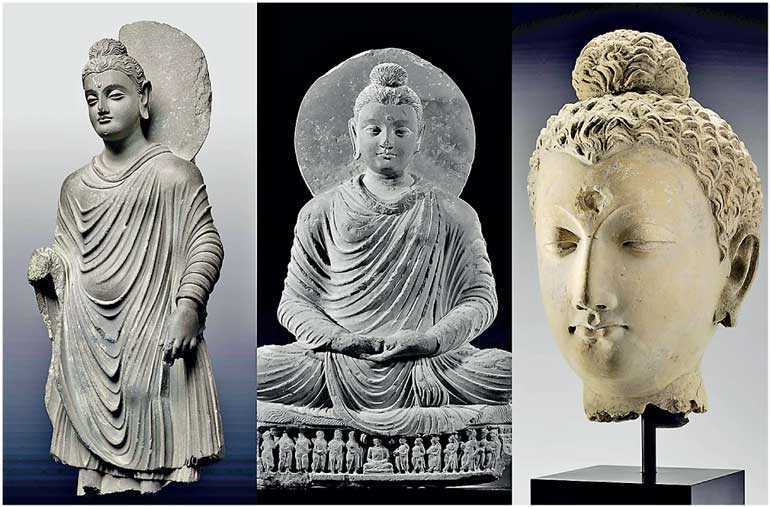 The famous Avukana statue, also built in the 5th century AD, is considered to be one of the best examples of Gandhara influence on Sri Lankan Buddha statues (with a pinch of Amarawati art!). Thus, it is quite obvious that most things we hold dear and precious are in fact born out of many roots. The next time you find yourself in front of a Buddha statue, don’t forget to pay homage to those Greeks!